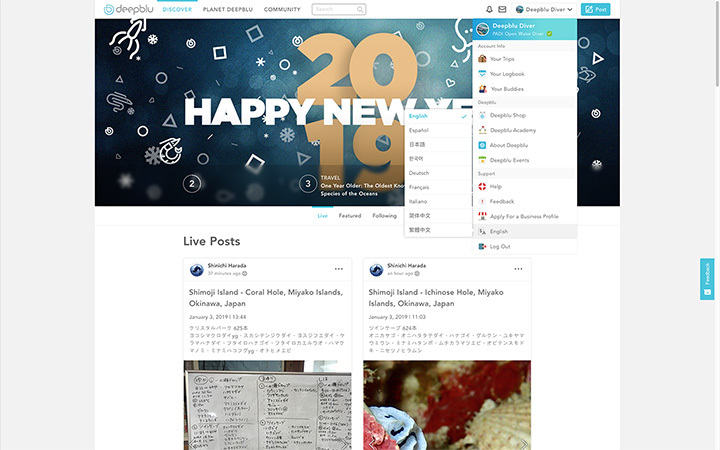 As Deepblu represents divers all over the world, we have translated our application into 9 different world languages: English (default), French, German, Italian, Spanish, Korean, Japanese, Simplified Chinese and Traditional Chinese. To use the Deepblu app in the language of your preference, you can change the language of your phone’s operating system. Please refer to the manual of your phone on how to do this. To set the Deepblu website in the language of your choice, click the user menu and find language. The entire user interface will change as soon as you make a selection.